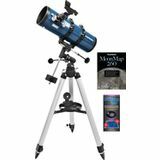 This big, yet compact GoTo 150mm-aperture Mak-Cass collects a ton of light with its 5.9" objective lens, and its extra-long f/12 optics provide exceptional views of the planets, Moon and deep-sky gems. Included eyepieces provide 78x and 180x views. 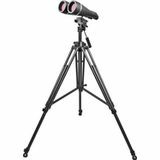 The Orion StarSeeker IV 150mm GoTo telescope presents a winning combination of motorized object-location technology and great optical performance. 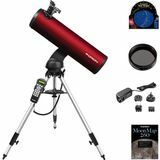 With the extra accessories in this value-packed kit, the whole family will have fun stargazing. 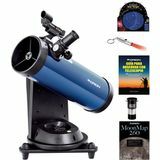 This telescope package includes materials featuring Spanish text. 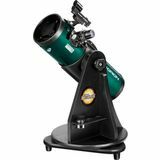 The Orion StarSeeker IV 150mm GoTo telescope presents a winning combination of motorized technology and optical performance. Value-packed kit includes extra accessories. 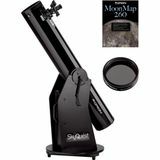 The XT6 Dobsonian has a stable mount, provides bright views and is easy to operate.This Moon Kit includes the complete telescope plus a Moon Filter and MoonMap 260! This package includes materials featuring Spanish text. The SkyQuest XT8 Classic Dob has features to please both beginners and experienced stargazers. 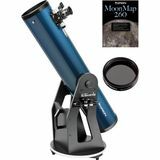 This value-packed Moon Kit includes the complete telescope plus a Moon Filter and MoonMap 260! Includes materials featuring Spanish text. The SkyQuest XT8 PLUS Dob is equipped with useful extras and deluxe features to enhance your stargazing experiences. 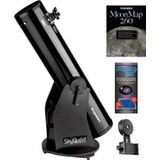 This Moon Kit includes the complete telescope plus a vital Moon Filter and MoonMap 260! 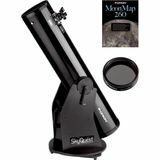 With this 3" reflector telescope you can view the cratered surface of the Moon, the rings of Saturn, and gigantic Jupiter along with its brightest moons. 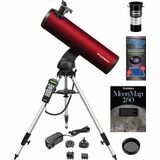 This value-packed kit comes with a Shorty 2x Barlow and the Orion Beginning Stargazer's Toolkit. 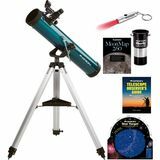 This telescope kit includes materials written in Spanish. 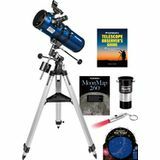 This value-packed kit comes with the complete Orion StarBlast 114 AutoTracker Reflector Telescope, a Shorty 2x Barlow and the Orion Beginning Stargazer's Toolkit. Our compact StarBlast II 4.5 EQ combines 4.5" aperture wide-field (f/4.0) parabolic reflector optics with a sturdy equatorial mount equipped with slow-motion controls. 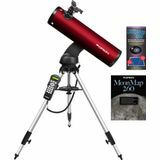 Value-packed kit includes a Shorty 2x Barlow and Beginning Stargazer's Toolkit. The Orion StarBlast II 4.5 EQ Reflector is a perfect family telescope. Its short focal length allows you to see more of the sky, which makes it easier for beginners to find objects. 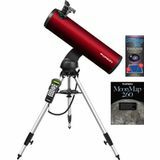 Includes 25mm and 10mm Plossl eyepieces, MoonMap 260, and more! Check out craters on the Moon, the rings of Saturn, and gigantic Jupiter in this 76mm aperture reflector telescope. 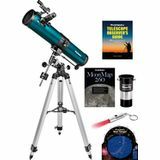 This value-packed kit comes with a Shorty 2x Barlow and the Orion Beginning Stargazing Toolkit. 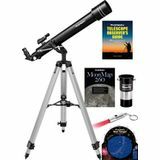 This complete kit comes with everything you need to observe the night sky. 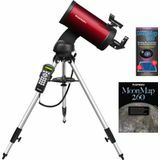 Includes Observer II 70mm altazimuth telescope, 25mm and 10mm eyepieces, red-dot sight, diagonal, Shorty 2x Barlow, MoonMap 260, Telescope Observer's Guide book and more!